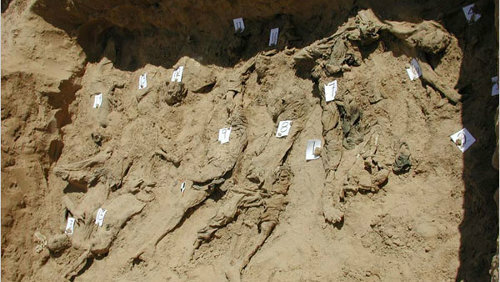 Photographic proof of a mass grave in Dasht-i-Leili, Afghanistan in a Physician for Human Rights photo published in the New York Times July 10. It was left to film-maker Jamie Doran, in his documentary “Afghan Massacre: The Convoy of Death” [available below, via Google Video], to present a series of explosive claims, which remain unanswered. Doran, who concluded that up to 3,000 men were killed in the convoys, sought out eye-witnesses to explain what had happened. While no one claimed that the Americans had any prior knowledge of the massacre, an Afghan soldier said that, when confronted with the corpses of several hundred men, “The Americans told the Sheberghan people to get them outside the city before they were filmed by satellite.” He also visited Dasht-i-Leili with a driver who said that he was accompanied by 30-40 American soldiers when he brought wounded men to the site, who were then shot and buried.